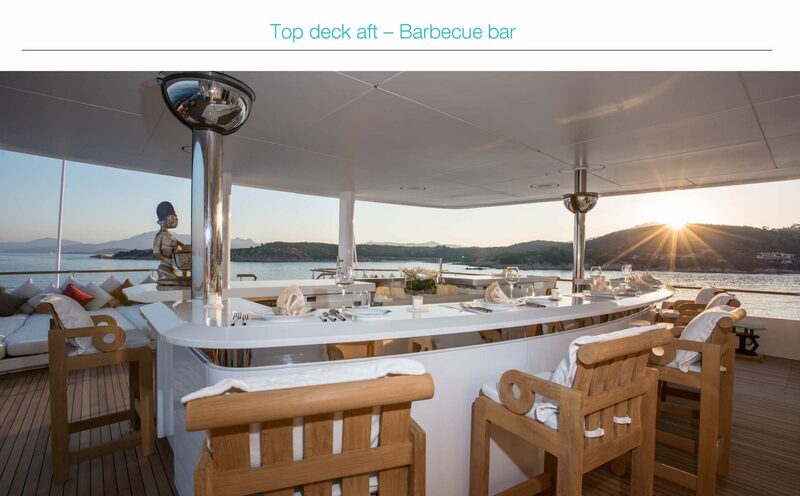 Vast exterior deck spaces including BBQ/bar, plunge pool and ample sun lounging spaces - perfect for relaxing or entertaining! 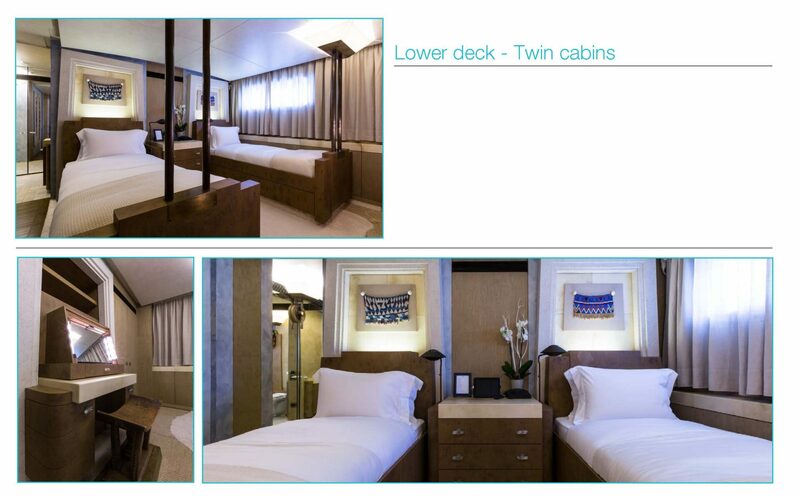 Large Owner's suite on the top deck extending down to the upper deck with panoramic views. 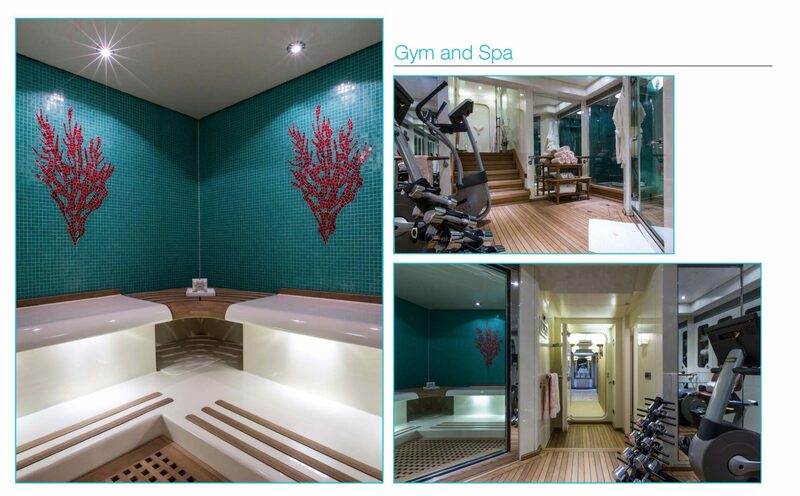 Gym and spa complex with steam room. 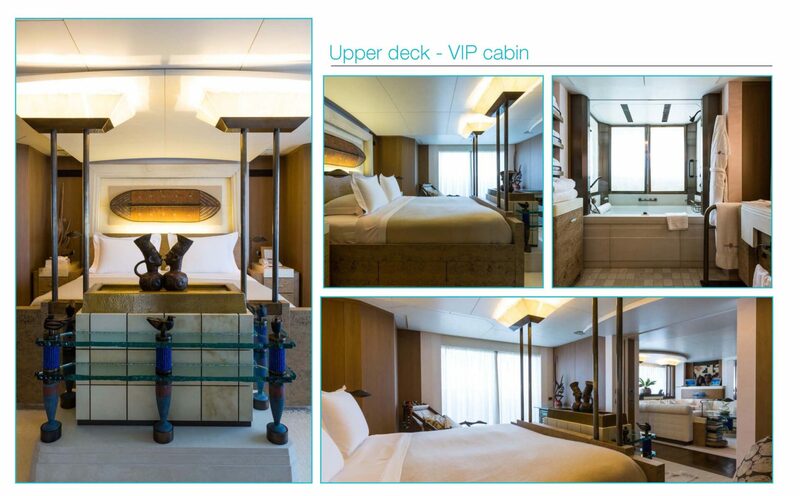 Accommodates up to 12 guests (master, VIP, 2 double and 2 twin guest rooms). 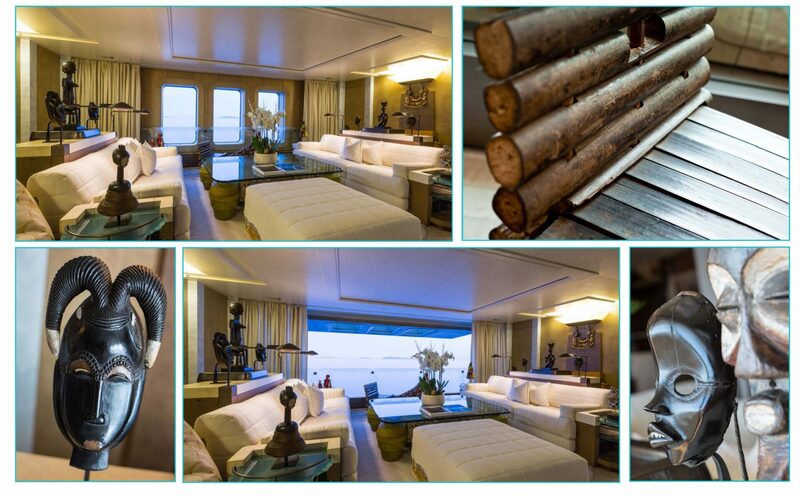 Interior design by Jon Bannenberg with flavours from Africa and Polynesia. 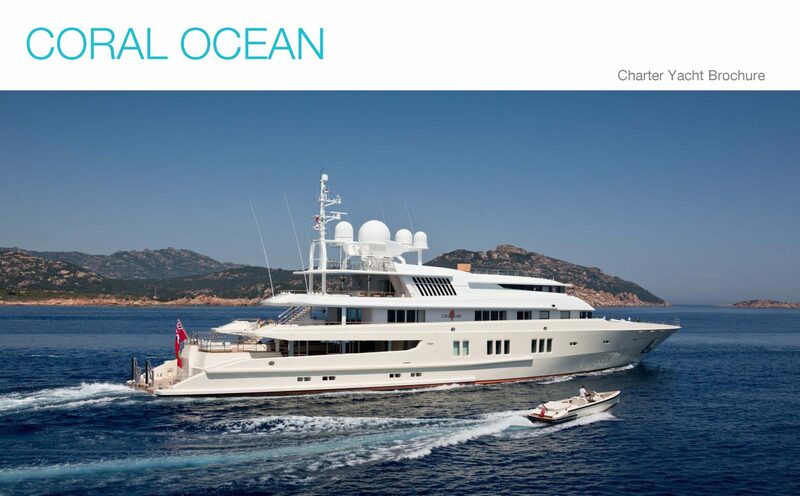 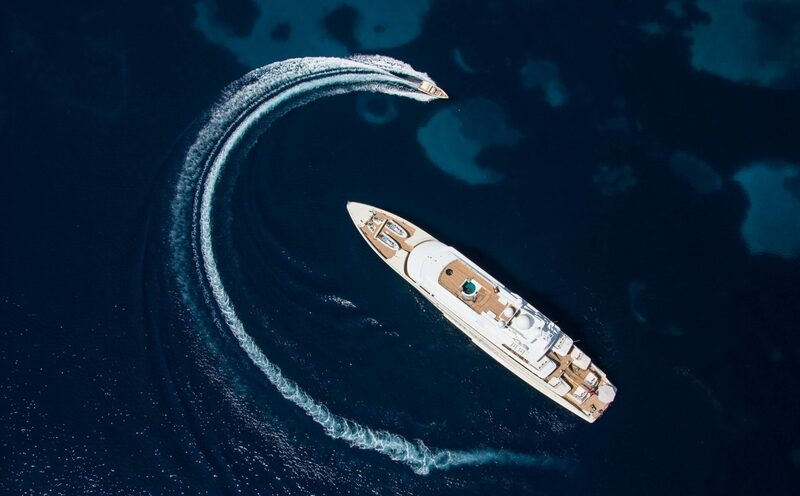 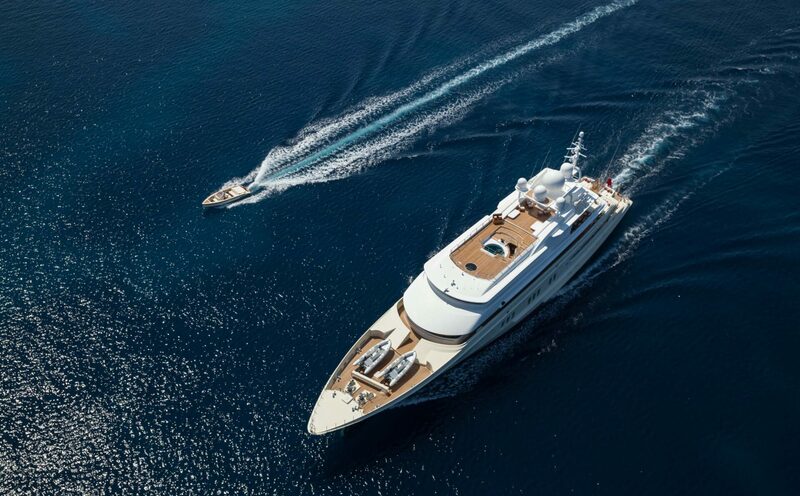 Available in the Mediterranean during the Summer of 2017, CORAL OCEAN is an enormous, four-story, 238 foot, Lurssen (Germany) motor yacht, built originally in 1994 but refitted in 2015/2016 with an amazing “folk art” interior design by Jon Bannenberg. 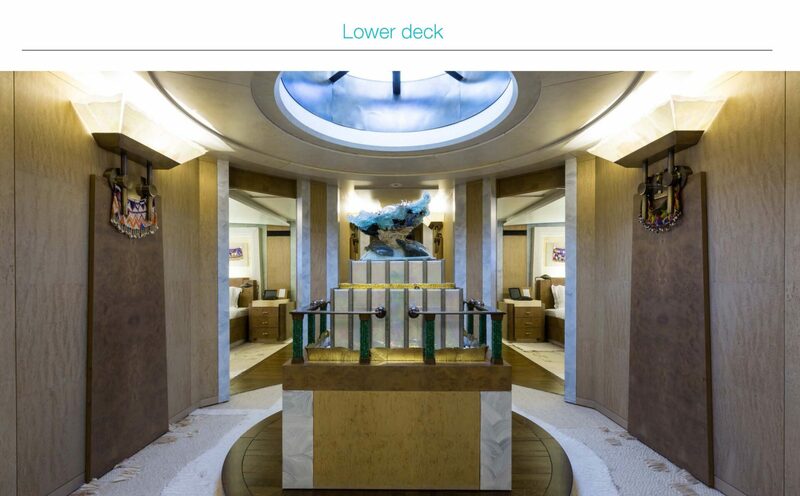 Climbing up the boat deck, bridge deck, and upper deck, a tower of stairs on the outside of the superstructure connects all four decks from the dock up. 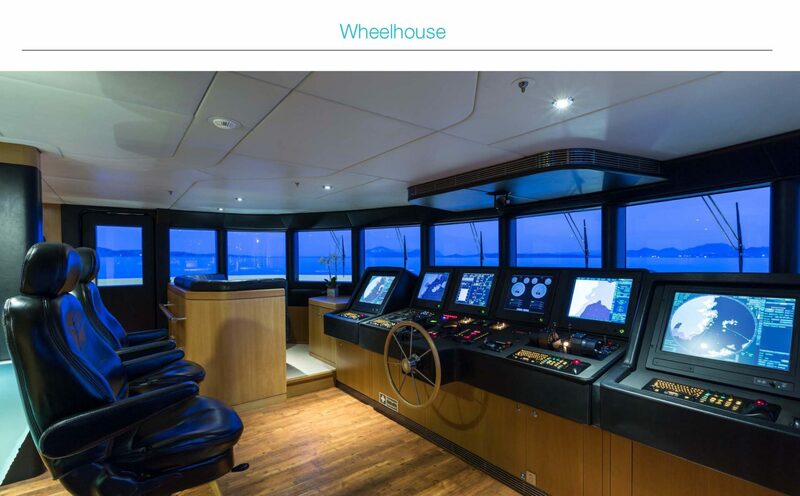 Security cameras monitor movement on the gangplank from the bridge. 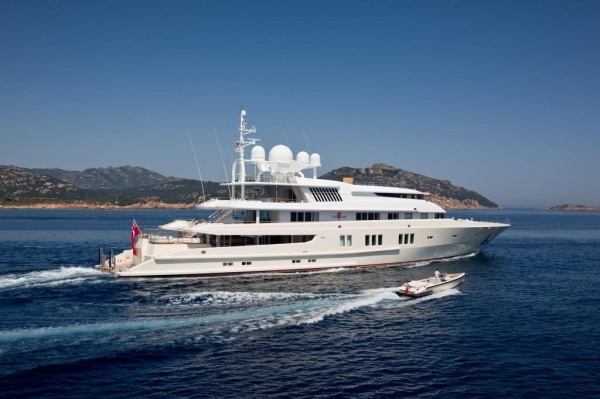 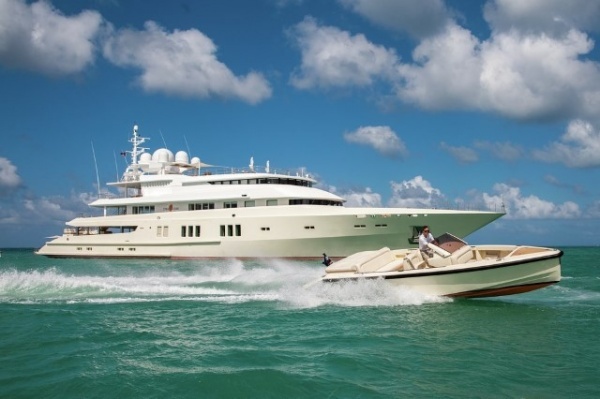 The yacht operates with a crew of 19, led by Irish captain Brian Skally, who has fifteen years of professional experience, running yachts this size. 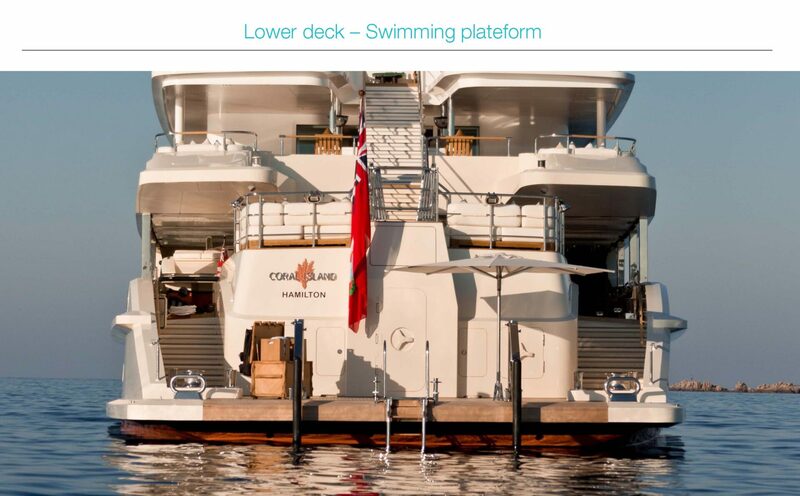 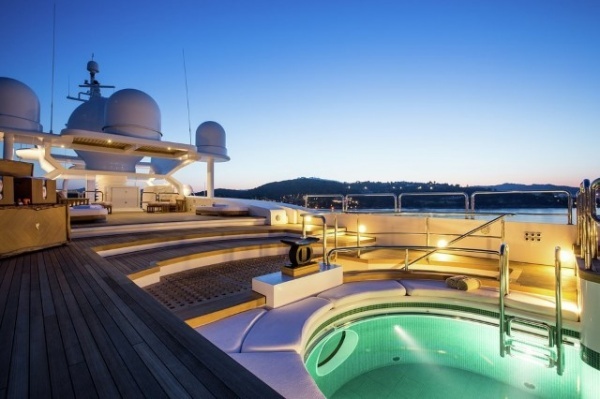 From the swim platform aft, guests enter the steam room and exercise room and find a short cut from the stern straight in to the accommodation deck, where two Queen cabins and two Twin cabins offer audio-visual systems, satellite television, iPod docking stations, iPad, iPod, and TVs…. 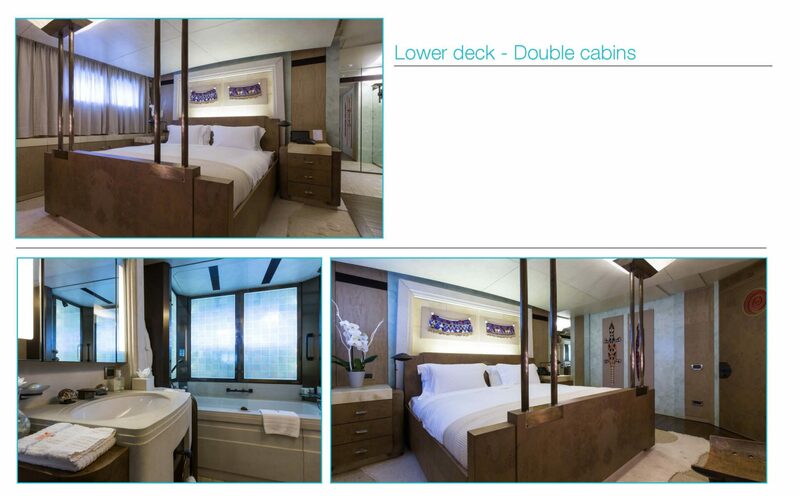 Two additional cabins are located up on the bridge and upper decks….accommodating twelve guests in all. 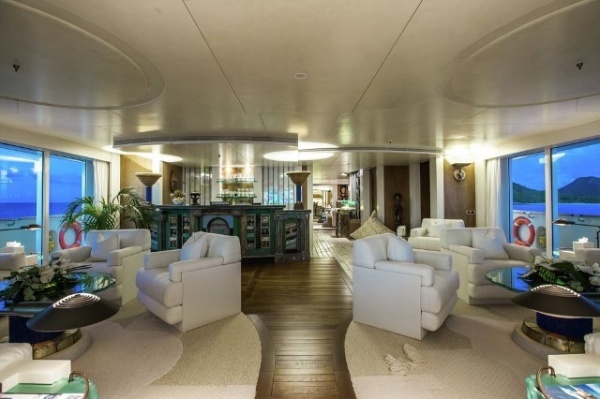 A bulkhead in the main saloon opens up to the out of doors. 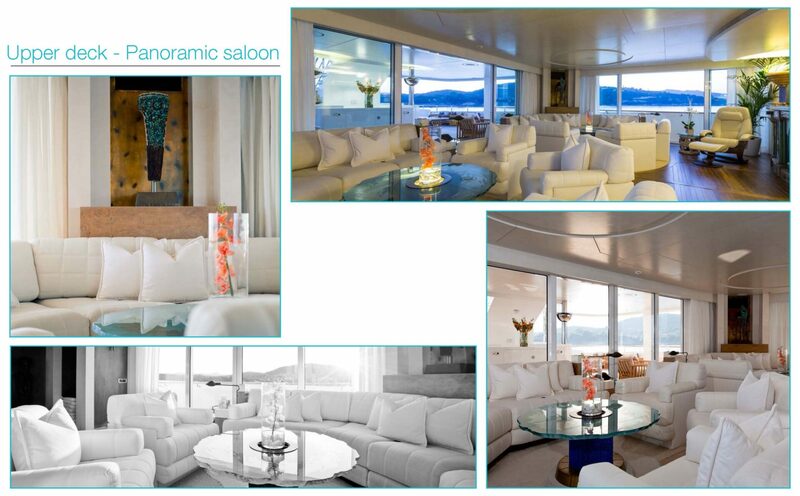 Here statues of tribal queens and animal tooth objects d’art, and overstuffed batik pillows contrast with the comfortable white sofas and solid gold wallpaper that surround an enormous glass coffee table with stone pedestals and this wonderful window that opens to the breezes. 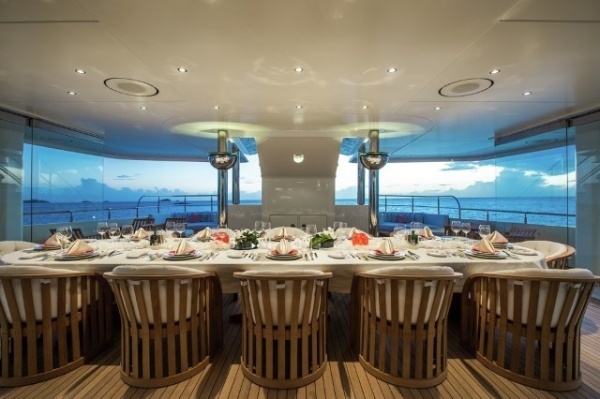 In the dining room, two oval tables combine to make one large dining table forward of the saloon and seat sixteen. 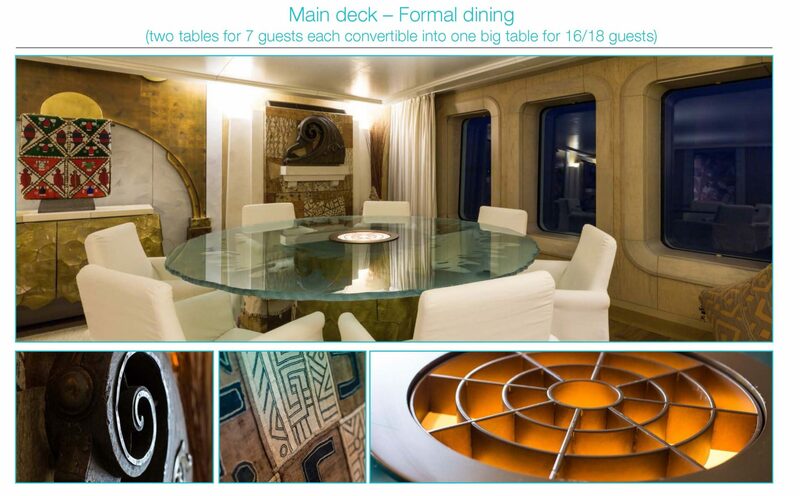 Rustic tapestries, hand-carved wood railings, the enormous round dining table with thick glass table top and massive, stone pedestal celebrate African culture at its finest. 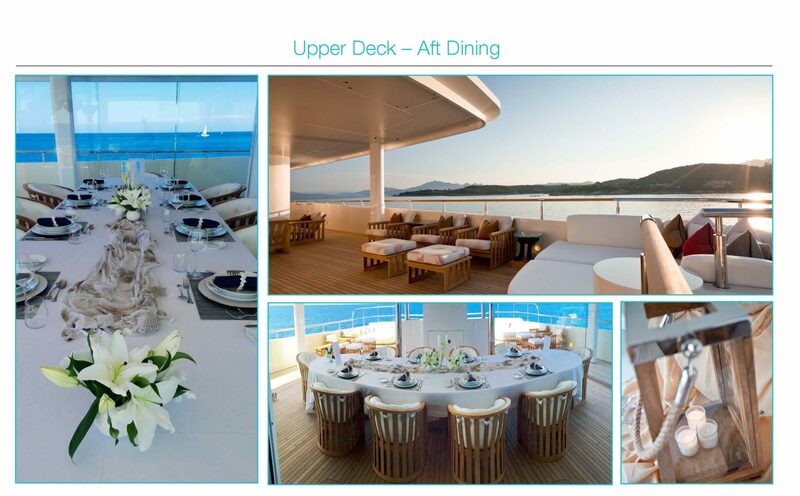 Up on the bridge deck, four seating arrangements open to one long dining table aft in the enormous sky lounge. 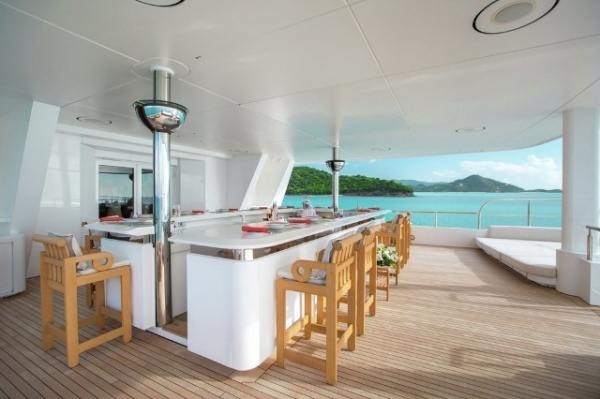 The marble bar with stools is solid and massive. 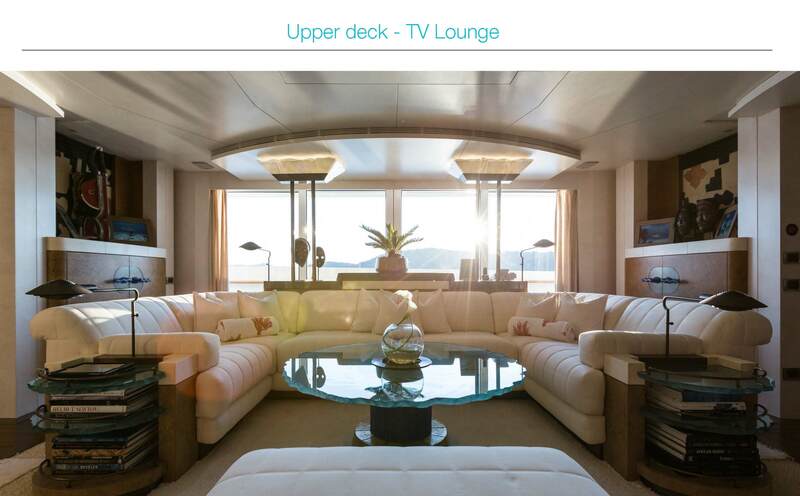 The soft white sofas are thick padded and inviting, and floor to ceiling windows enable this sky lounge to be called the Panoramic Saloon. 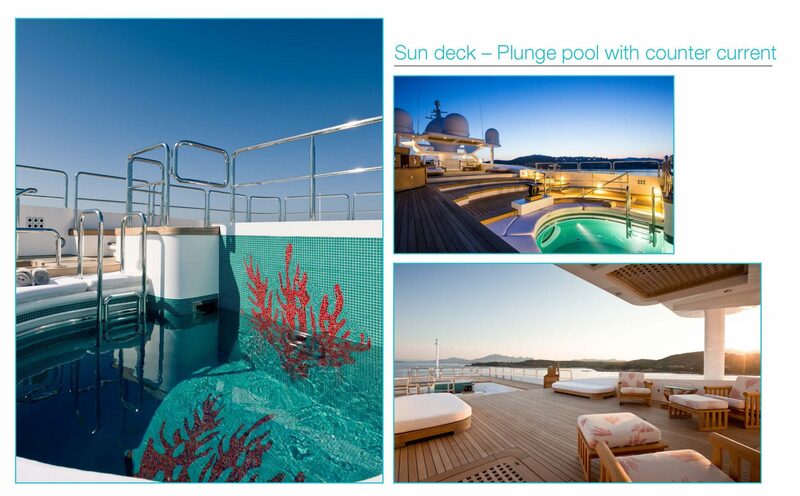 Blackout screens are available for movie night. 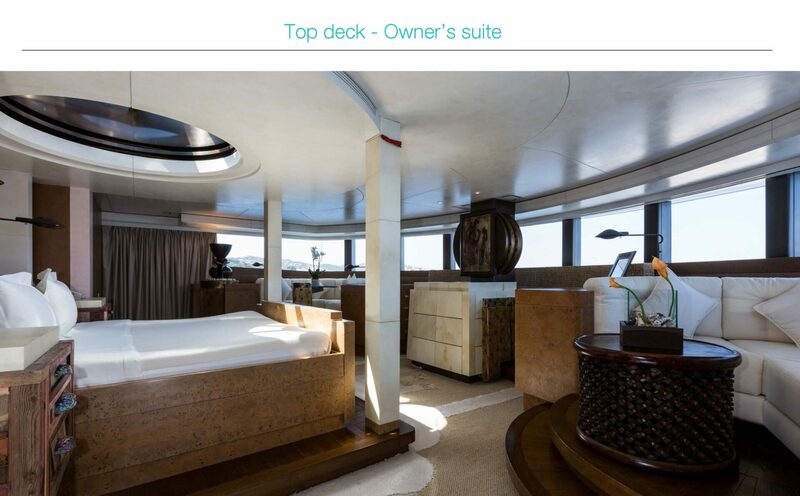 This comfortable room leads forward to the full-beam, VIP, bridge deck master cabin, which is one with the sky lounge through clever use of space. 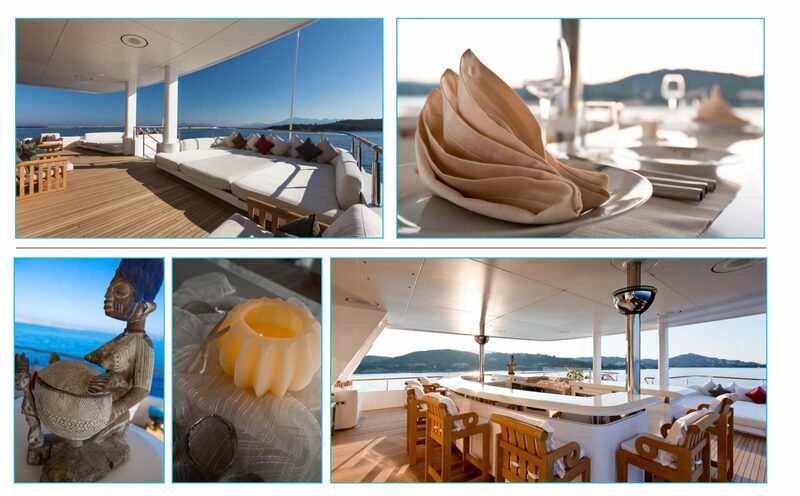 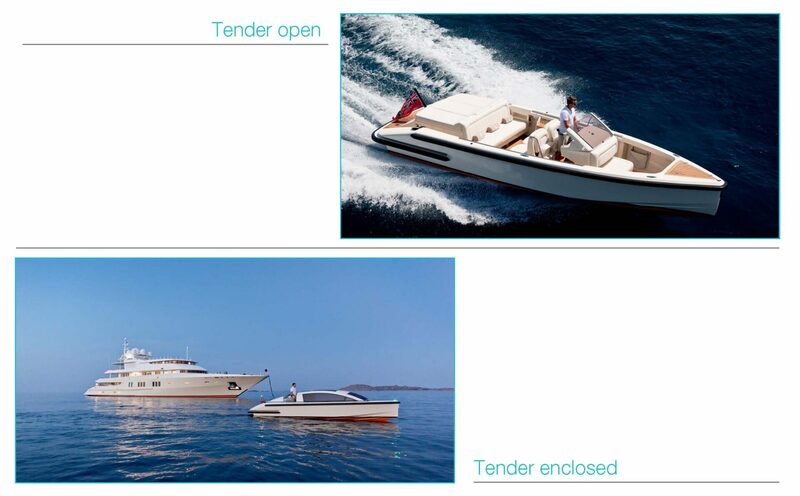 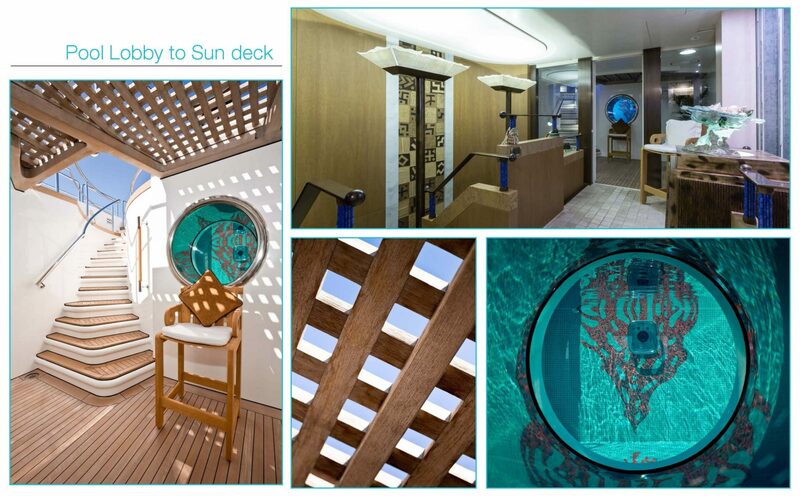 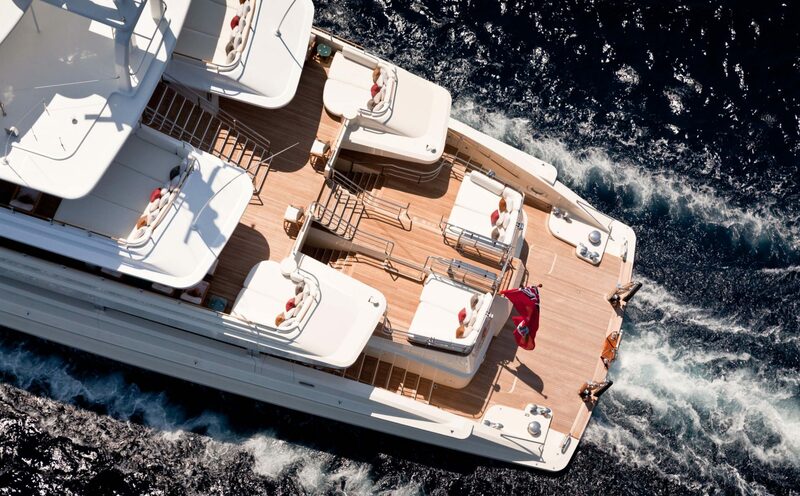 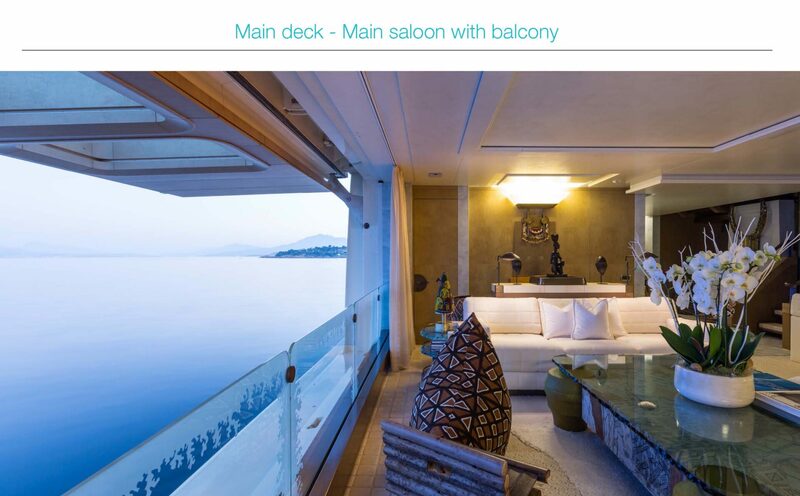 The master stateroom is located on the upper deck, where most yachts have their sun decks…. 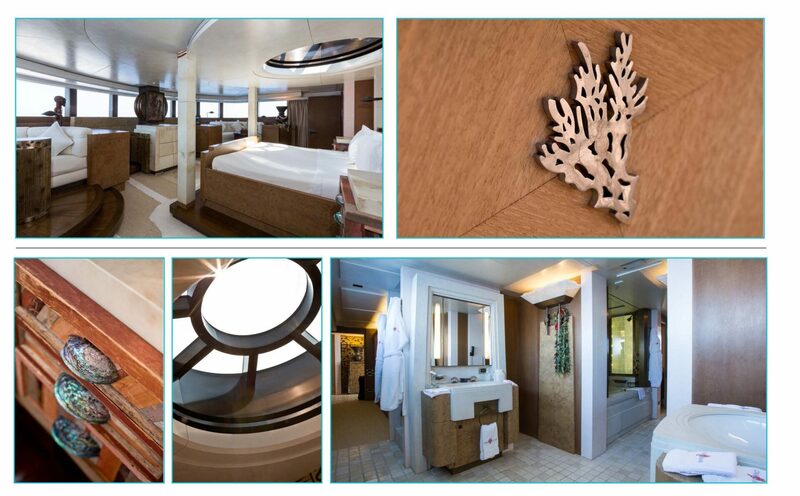 The master bed faces forward through windows overlooking the bow. 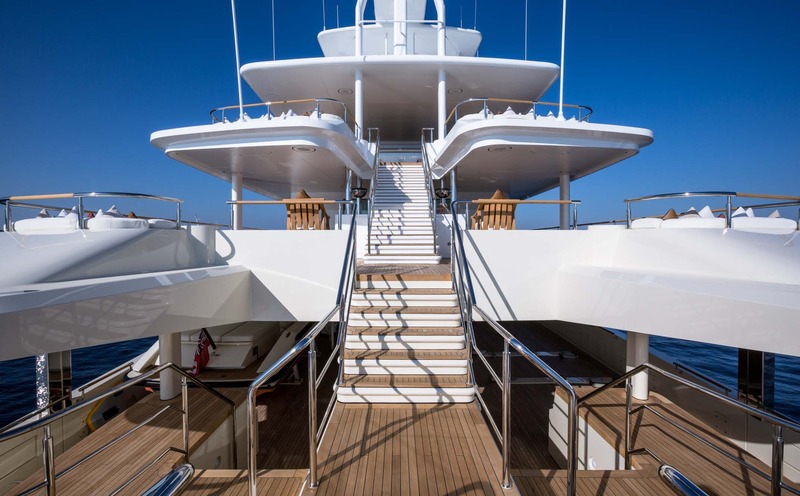 Two round settees flank both sides of the bed, which moves up into the moon roof or skylight overhead with push-button efficiency. 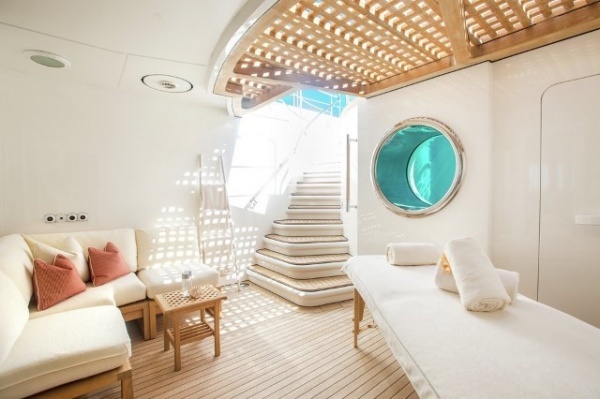 The enormous master bathroom features views of the cruising ground from the bathtub and wraps around to a small TV lounge and continues on to stairs to the sun deck, ending in a plunge pool with counter current. 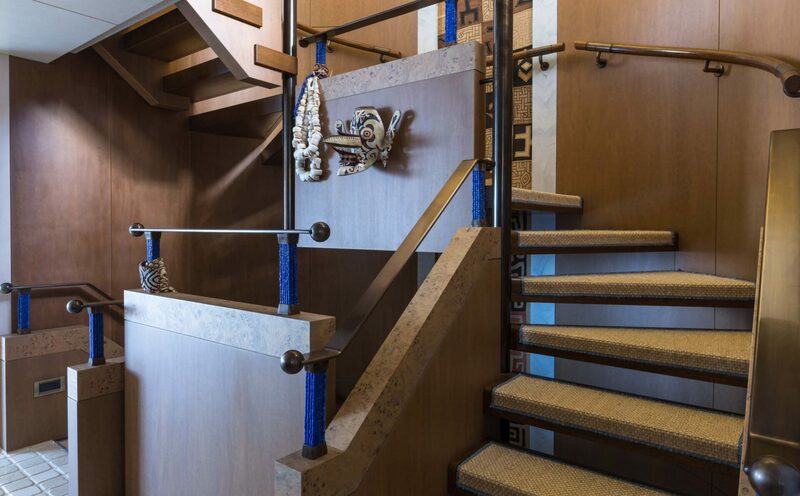 An atrium continues the experience, eventually leading to a large aft dining area, where the bar chef entertains guests with sushi making.